In 1527 Hector Boece, the first Principal of King's College Aberdeen, wrote in his extensive 'History of the Scottish People' of an island of rocky crags and prehistoric sheep, which could only be reached through extreme danger to life. It was, he explained, 'the last and outmaist Ile' of Scotland. 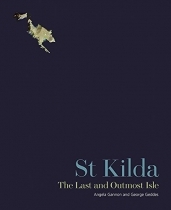 It was St Kilda. St Kilda breaks the waters of the Atlantic Ocean some 100 miles west of the mainland, and 40 miles west of the Outer Hebridean island of North Uist. On clear days it appears as a dark silhouette on a distant horizon. Approach it, and it resolves into seven shapes - the four islands of Hirta, Boreray, Soay and Dun, and three towering sea stacks. It is an enigmatic and awe-inspiring landscape, a starkly beautiful vision of 'life on the edge' which has fascinated everyone from travellers, antiquarians and conservationists to writers,film crews and tourists. And, perhaps as a result, it is one of the most mythologised and misunderstood places on earth.